The title above may indicate the beginning of a romance novel, and that isn’t inaccurate. This piece captures the introductory story of our athletics community through my intimate relationship with Yale-NUS athletics during the first two years of this college. The love story started with my first interaction with Yale-NUS athletics. To date, I have represented Yale-NUS College in ten different sports: Floorball, Football, Captain’s Ball, Volleyball, Ultimate Frisbee, Badminton, Squash, Table Tennis, Contract Bridge, and International Chess. There was no need for awkward introductions. Not only did I participate, but held a number of leadership positions within the athletics community as well. Alongside a motley crew of dedicated batchmates, I was the Point of Contact for the inaugural Yale-NUS Athletics Council as well as Yale-NUS’ inaugural Sports Director. A huge part of my job was to organize our various sporting competitions: Inter College Games 2014 (ICGs) , Inter Faculty Games (IFGs) 2014 and ICG 2015. 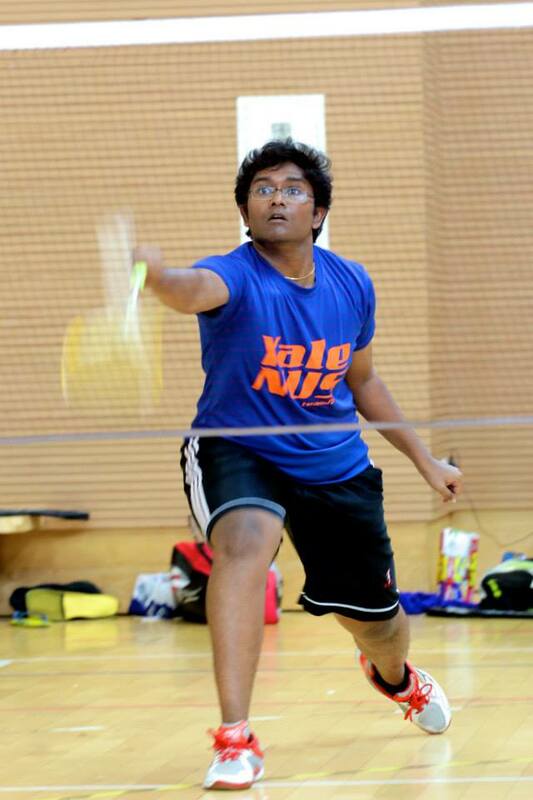 Tinesh Indrarajah playing badminton for Yale-NUS College. Sports, being by and large a collective effort meant sports teams had to be established. I took up these administrative responsibilities and rallied my batchmates together. The seniors may be familiar with the “Badminton and Table Tennis with Tinesh” at the Residential College Four Multi Purpose Hall. With no established sports teams and training schedules, the atmosphere within our sporting community was very congenial. We tried new sports, joined multiple teams to make the numbers and generally had a fun time in the MPH. Due to the small size of Class of 2017, there would also be lonely days in the MPH- three people hitting around a volleyball, two v two floorball matches or just a singles badminton game. Those weren’t the golden days for sports in Yale-NUS. All of this changed when Sylvia Gan ’17 became part of the UTown Organizing Committee for ICG 2014 during late 2013. We now had a goal to aim towards. Training became more focused; strategies were discussed; personnel were recruited. Yale-NUS College was preparing for its first sporting competition against colleges who were at least four times our size. Many athletes played three or more sports, even more played at least two. In total, we had approximately 60 athletes participating in about 15 sports. That was just how committed we were. However, like in every sellout romance novel, there awaited heartbreak. The 2014 ICGs lasted for four days, and during this particular ICGs, there were only four teams: Tembusu, CAPT, USP, and YNC. At the start of the last day, we were ahead of Tembusu College by one point and just needed Tembusu to not finish second or higher in floorball. The breakdown of Tembusu’s floorball matches against CAPT and USP was devastatingly similar. In each match, Tembusu would score an early goal. We would be deflated on the sidelines. CAPT and USP would then equalize, and we would cheer for them. CAPT and USP would then go on to score another goal and race into the lead, where we would cheer even louder! But alas, with about a minute to go in both matches, Tembusu would always manage to score an equalizer to ensure them a second place finish. I had to lead our floorball team out for our last match against CAPT knowing that we already had lost the title. That was beyond doubt the most heartbreaking moment of my Yale-NUS athletics career. The 2014 ICG Captain’s Ball Team. 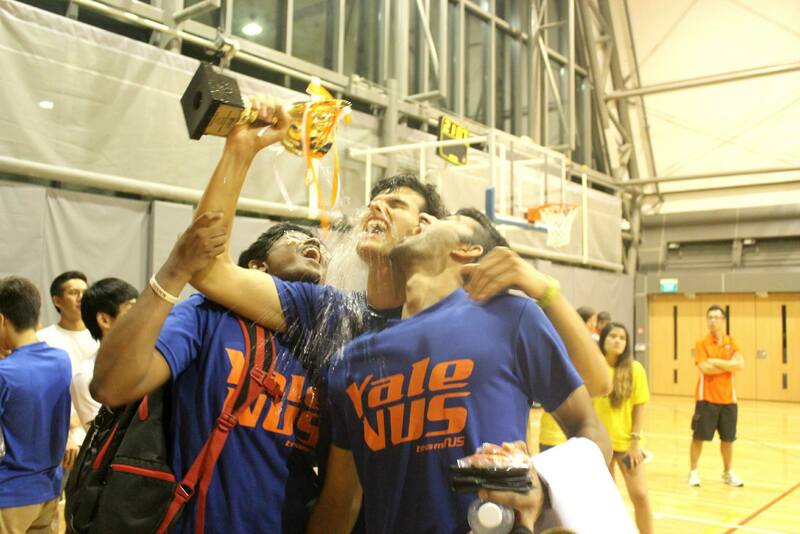 Now that Yale-NUS athletics knew the bitter taste of defeat, we were committed to winning the ICG trophy at all cost the following year. For ICGs 2015, I was not only an organizer, but also a participant in seven sports throughout two crazy weeks. The critical turning point for us was that we were now about 300 strong. The Class of 2018 had many remarkable athletes who complemented the talent in the Class of 2017 to produce a united, cohesive, and determined Yale-NUS squad. In the end, ICG 2015 was not really a close fight. 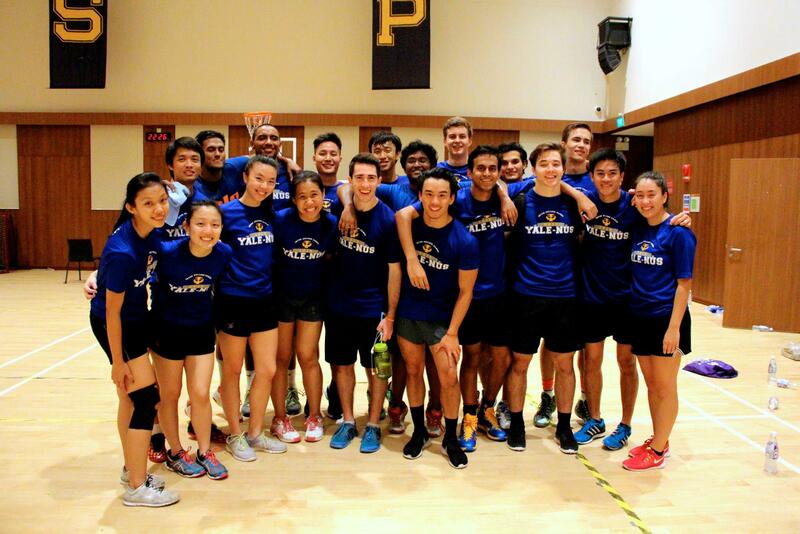 Yale-NUS won the entire tournament with a cushion of at least 15 points more than second-placed Tembusu, with multiple gold and silver medals throughout. My favorite moment from the entire tournament was the Captain’s Ball finals. It was Yale-NUS Team A versus Yale-NUS Team B. Good things came to those who wait, and needless to say, revenge was sweet. ICGs 2015: From Heartbreak to Victory. [Left to Right] Tinesh Indrarajah ’17, Raeden Richardson ’17 and Rakesh Prabhakaran ’17. From hope to heartbreak to victory, Yale-NUS athletics will always have a special place in my heart. To win ICG 2015 was the highlight of my Yale-NUS athletics career. My experience during Yale-NUS’s first two years illuminated the wonderful character of our community; that our passion and motivation can unite and allow us to overcome setbacks at the same time. My love story with Yale-NUS athletics has not yet ended as I will still be here for one more year. However, to my fellow athletes and devoted supporters from the Class of 2017, thank you for all your effort and contribution in making Yale-NUS athletics what it is today. May this piece act as a prologue to a largely unwritten novel. May current and future members of the Yale-NUS athletics community be inspired by the stories of your predecessors as you embark on the chapters ahead.